We all know we’re supposed to brush our teeth. It was ingrained in our minds as children to make sure we brush long enough, with a certain amount of tooth paste, and in a specific direction. Of course, after we understood the process, we do it passively, without thinking on whether or not we’re actually brushing long enough, or reaching all the places we need to in our mouth. Seeing that an entire army of germs enters your mouth every day that could potentially get you sick, it’s rather important to cleanse your mouth out appropriately. 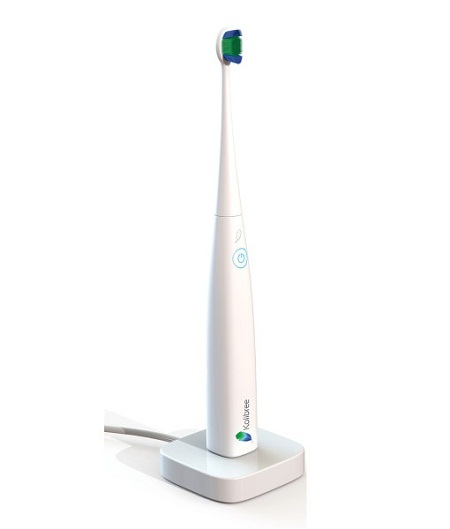 The Kolibree Electric Toothbrush is not only going to help you accomplish just that, but it will also be connected to your smartphone or tablet to let you know how you’re doing. Thanks to all this grand technology they stuffed in a toothbrush, you can now monitor your habits, and improve where it’s needed. It can show you where you’re missing, keep you up to date on your brushing average, and detect what part of your mouth needs a little more TLC. Of course, this is pretty useful for families with kids, so the paired app can follow up to five people. The better you do over time, the higher ‘score’ it will give you, so can feel a form of accomplishment rather than just getting the results you want. This will cost you around $99-200 depending on the model you choose. This is pretty darn pricey for one toothbrush alone. The best part of this is that this won’t even be available for purchase for at least another year, as they’re currently planning for a crowdfunding campaign this summer.